Which came first – the chicken or the egg? Everyone knows the correct answer is the egg … and by “egg” I mean “floor plans”. I posted a sketch last week of an elevation study and was asked a simple question: do I design the floor plans first, or the elevations? The correct answer is that the floor plans get developed first, but there is still a lot of give and take when it comes time to develop the exterior elevations. 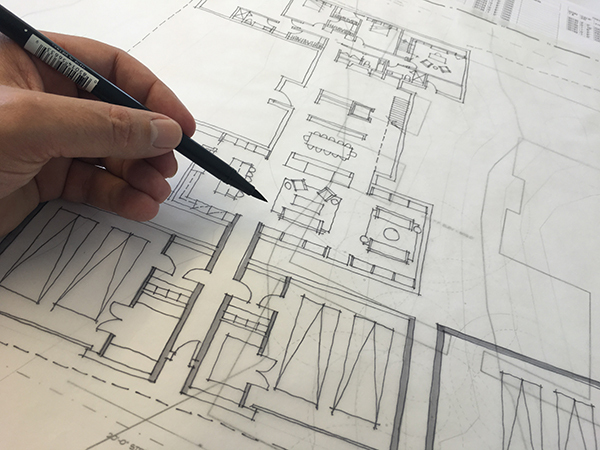 I generally have something in mind when I am putting together the plans on how I want the elevations to look – but the plans are the first piece of the puzzle. For me, I start with the generic concept of how I want the building mass to work. I think about the forms and the shapes, and I think about how the space around the forms is going to work. Questions like: How does the approach to the house feel? – or – What sort of living spaces will be a part of this view? are the considerations for how the building massing will work and what sort of views I want to create from within the house. Other than that, the initial floor plan concepts are about getting the programming, room sizes, and adjacencies correct. See that computer drawing above? It’s pretty nasty, isn’t it? I’ve seen potato salad left out in the sun that looked better than this elevation – but that’s okay – this isn’t a design elevation, it’s a study on massing and it is only the very first step of many that are about to happen. I had the floor plan I sketched entered into Revit (because I’m not a caveman) and had the exterior elevations blocked out. I gave direction on vertical heights and roof slopes … and the image above is what I got. Clearly, it needs a whole lot of attention. So here is what you get after a few quick passes – a lot of scale and proportion rework. The scale was all kinds of wrong, and the first thing to do was change the roof pitch. I also started to consider where I was going to put in windows … and what sort of composition I was going to try to achieve with this elevation. The clients want a modern house, but they live in a development that has aesthetic requirements that slant a bit more towards the traditional. As a result, I was going to try to find a balance between designing a house that was rooted in traditional massing and proportioning, but also had more modern elements to it. In my mind, this meant channeling my favorite Art’s & Crafts architect, Sir Edwin Lutyens, so that I could bridge the gap between styles and use asymmetrical hierarchy to achieve my intended result. I know … “Asymmetrical hierarchy” is the most architectural thing I’ve ever said on this site. Asymmetry simply means that the massing will not be symmetrical – although there will be balance … that’s where the hierarchy part comes in. Hierarchy in this case simply means that there will be items (windows, doors, etc.) that are placed within the building massing with different level of importance. I included the video above to give you an idea of what the overall floor plan looks like at this stage of development. I will end up going back and forth between the floor plan and the elevations as each is developed with growing clarity. Now that I’ve blocked out the massing for the building, it’s time to start sketching in openings – like doors and windows. You might have noticed that I didn’t draw in any windows into my floor plans in the beginning – it’s because I wanted to wait and see how the exterior elevations would be developed. I had an idea of where windows would go, but I waited until I could see how the proportions and massing of the elevation came together. If you are really clever and observant, you’ll notice that there was one significant plan change between the plans and the sketches for the exterior elevations. So this is one of the elevation studies I produced. Truth be told, I have about 15 or 20 of these sorts of studies. This is the sort of thing I always think about whenever I get comments from people who think I am wasting my time sketching rather than simply drawing these elevations directly into the computer. Each one of these studies took me a few minutes and I don’t care how fast you think you are at AutoCAD or Revit … whatever, you aren’t faster than me when I am sketching. It would be one thing if I was completely ignorant to how the drafting process worked, but I’m not. At this stage, I am looking at big picture items – massing, scale, proportion, even materiality. When it comes time to actually draw this in a manner where the size of the windows course out with the building siding matters – I will defer to CAD. As the exterior elevations are being developed, changes to the floor plan naturally occur. The significant plan change I mentioned earlier – did you find it? If not, it was the massing at the front entry. I needed to change the footprint of the building so that I could change the scale and massing of the front approach. As a result, I added a small covered entry porch at the front door – a move that will allow me to change my roof line and bring the scale of the approach down to a more human scale. Here is my final sketch for this particular scheme … it’s not a presentation drawing, it’s for communicating within the office on how we want the direction of the house to develop. The people who will be helping me on this project will take this sketch and start inputting it into Revit to make sure that the scale of my sketch considerations translates to actual building materials. We will also need to extrapolate these ideas and start working our way around the other sides of the house – which will be relatively easy since we’ve now worked out a concept for how the building will appear. So back to the original question – which comes first, the floor plan or the elevation? 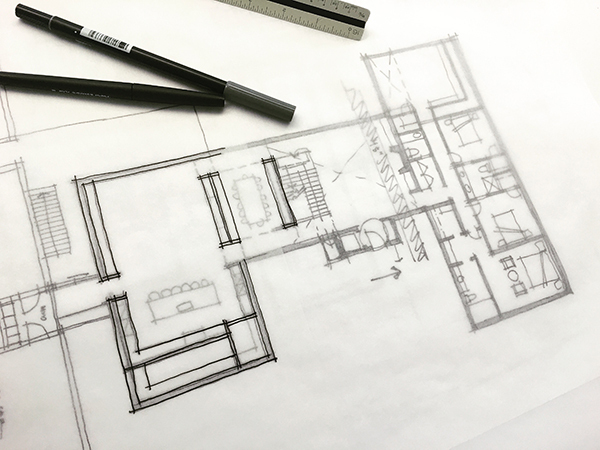 The floor plans always come first, but there is an ebb and flow between both the floor plan and the elevations that will require most designers to be somewhat fluid in their design process. Cheers – and happy designing.